with Funsho Bamgboye adding a second moments later. entertaining and beautiful finale to Chile 2015. 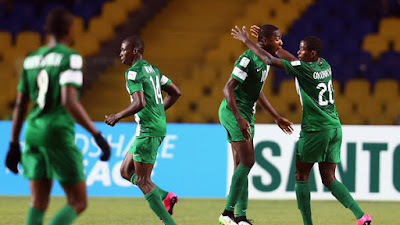 The Nigeria golden eaglets led by the Ex-Nigerian international Emmanuel Amunike(coach) emerge the winner of the just concluded U-17 football tournament hosted by Chile, beating their African counterparts Mali, by 2goals to nothing, the first goals which was scored by Victor Osimehn followed immediately by Funsho Bamgbose with tremendous shot in the 18yard box which left the keeper with no option than look into the net. The two sides played aesthetically and excellently, being the first time in the history of the competition for two Africans to play and scale through to the finals. 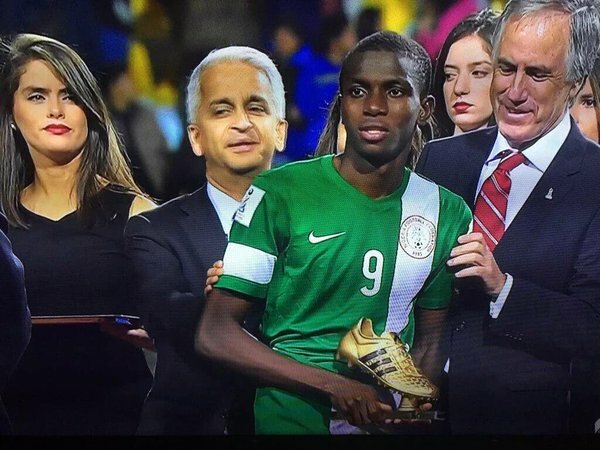 Nigeria swept the Mexicans of the way, while the Malians flitted the Belgians.This made it the 5th time Nigeria is winning the tournament. scorer, and the second best player kelechi kwali the Nigerian captain wins the best player award. Nigeria winner, Mali 2nd, Belgium crushed Mexico to secure the third place with a bronze medal.